We are super excited to announce that we've added Natural Language BI to the Knowi platform. With this addition, business users gain the ability to type, in English, a query and watch as we automagically interpret the question and present the results. It is specifically designed to provide self-service analytics capabilities to non-technical end users. They can ask questions and get answers without an in-depth understanding of the data or how it is constructed. There is a lot more to tell you about so keep reading! If you're more of a visual person, you can watch the replay of our product update webinar here. Natural Language BI is a powerful way to enable self-service analytics to non-technical users by enabling them to ask questions in plain English and get to insights quickly without needing any in-depth knowledge of the data or how it was constructed. Natural Language BI is available for all widgets within a dashboard. At the moment, it can be accessed using the Natural Language/Self Serve Analytics icon on a widget or by going into Analyze mode. Start typing your question in the search bar. We use machine learning to automatically suggest the next part of the question. When you're happy with the question, hit enter, and the results will be displayed. Easy as pie. Users can select the chart type they want to use and save the results to their dashboard to create their custom dashboards. If you're not familiar with Trigger Alert or Trigger Notifications, they are a powerful way to trigger an action based on criteria you specify on any dataset. 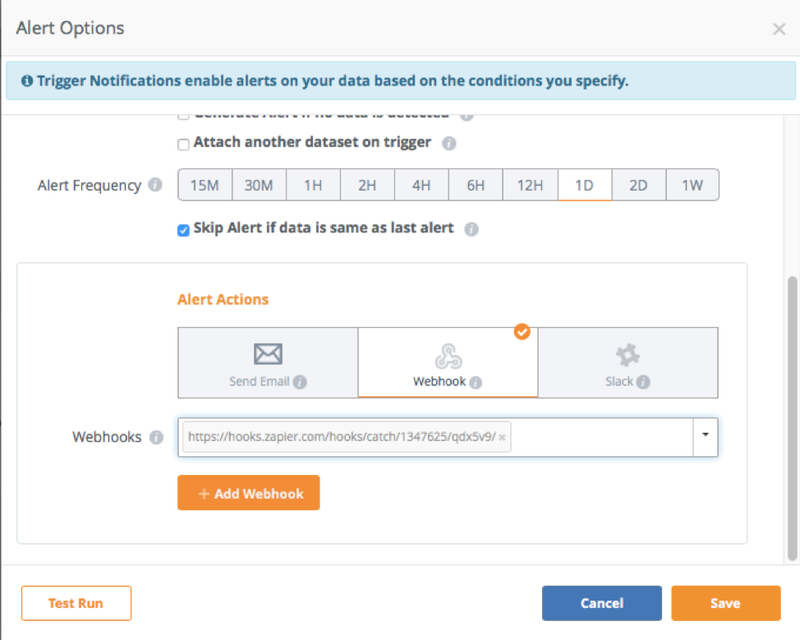 Trigger Alerts allows you to monitor datasets for conditions and send alerts, invoke an API, or send a notification to a Slack Channel. This capability allows you to get your data working for you. Instead of business users having to go to a dashboard to gain insights, the insights are delivered to them so they can take the appropriate action. To create a trigger alert, go to Alerts from Setting Menu. Knowi now supports the setting up of a connection with an LDAP server which will then allow users to login into Knowi using their LDAP credentials. If you require this functionality, please contact support. 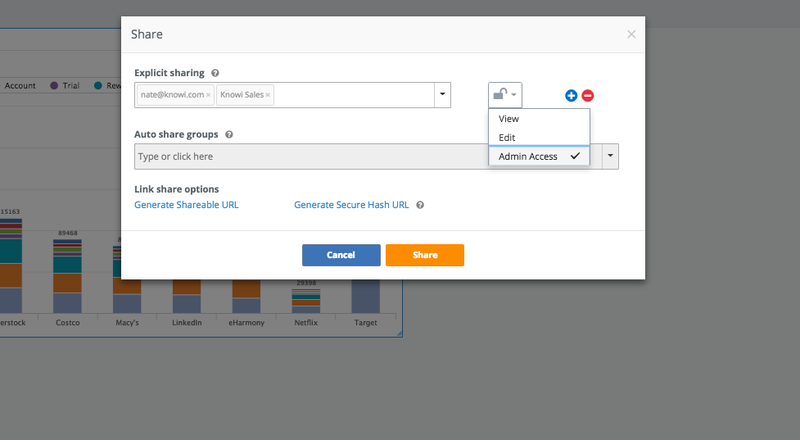 Support for sharing the administration rights on all Dashboards, Widgets, Reports, and Alerts has now been implemented. This will allow a user to grant admin access to assets they created for the purpose of on-going administration including edits, setting Global Filters, and changing widget level Cloud9QL. For secure embedding use cases, you can now specify a time to expire for a given share URL so the link cannot be reused beyond the expiry date. The display of time series chart legends and filters can be localized for a user by selecting the Locale option under User Settings. Useful for embedded dashboard and widget modes, this will then render any time series chart selected in the locale specified. Current locales supported are English (en), French (fr) and German (de). Runtime parameters can be applied to Direct queries to pass dynamic parameters into a query. We've added the ability to pass date parameters based on input from the UI or user configuration. With ElasticStore usage, the overwrite strategy provides you powerful control over how data is managed. We've added the ability within the overwrite strategy to specify how far back you want to retain your data. For example, Date-1m will remove all existing rows in ElasticStore which have Date field's value less than 1 month before the MIN value of the incoming data's Date field. You can use data retention in conjunction with other overwrite strategies.